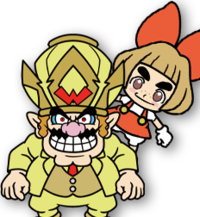 Sprite of Wario Deluxe with Lulu from WarioWare Gold. 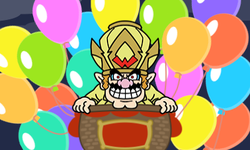 Wario Deluxe is a form that Wario takes in WarioWare Gold after putting on the Pot of Luxeville on his head as though it were a hat, granting him special powers. After stealing the Pot of Luxeville, Wario realized that he was out of money, so he hosts a gaming tournament to make some quick cash. However, when the player wins and comes to collect the reward, Wario greedily claims it for himself and puts the pot on his head. The pot suddenly turns into a crown with Wario's insignia, he gains a golden tuxedo, his eyes turn red and his voice becomes deeper. The sky turns dark and Wario appears on a hot air balloon shaped like his head with several more balloons. Wario Deluxe challenges the player to some more microgames, but then starts cheating by using his new powers to scramble the control warnings after 10 microgames, although if the player listens closely, the control scheme voice is faintly high-pitched, meaning the player might tell what control scheme is up next. After the player endures these four microgames, Wario Deluxe tauntingly asks the player if it is getting too tough, saying that they can give up. Just then, Lulu appears and fires some arrows at his balloons and grabs the pot, allowing the player to defeat him. Lulu then demands the pot be returned, but Wario Deluxe refuses to do so, so Lulu uses the Hydrocannon LX on him, causing the pot to fall off and reverting him back to regular Wario. Wario Deluxe also appears in the side mode Wario Interrupts where he distracts the player every three microgames. Winning microgames fills up a meter for a Hero Button which, once fully charged up, can be used to summon Lulu who will temporary stop these interruptions. Despite appearing to be possessed or powered up by the Pot of Luxeville in this form, his character cards suggest he is no more powerful than normal, bought the tuxedo himself, and has bloodshot eyes simply due to a lack of sleep. In spite of this, he demonstrates some abnormal abilities, as he has the ability to hide the control type prompts with his hands, summon a giant glass of wine, summon three Tiny Wario heads attached to balloons, and cover the touch screen with paint blobs. This page was last edited on January 30, 2019, at 02:35.